I spent most of my youth on our family’s farm in the panhandle of Oklahoma, attended Oberlin College near Cleveland, then The Ohio State University College of Veterinary Medicine. Graduation in 1988 led me to work in mixed animal practices in both Xenia and Millersport, Ohio. In 1997, together with my wife Julie, we opened Village Veterinary Care in Pataskala, Ohio, a hospital for pet animals and horses. My growing interest in equine dentistry was sparked when a client asked to purchase horse tranquilizers so that a non-veterinarian could float her horse’s teeth. 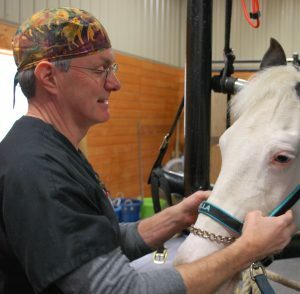 Being an avid learner, I started investigating horse dentistry to discover what I had missed in my veterinary education. Our equine dental practice grew, and in 2007 we sold the pet animal business and launched Equine Veterinary Dental Services, based in Licking County and serving all of Ohio. I took advantage of several educational opportunities which led first to a Fellowship with the Academy of Veterinary Dentistry and more recently to becoming a board certified Equine Dental Specialist with the American Veterinary Dental College. Each year, I perform over 1,000 dental procedures on horses, and I plan to continue researching the opportunities for this growing field of veterinary medicine. In 2014 we opened our heated drive-in facility, complete with stalls, a safety stanchion and weight scale. With the addition of 39 solar panels on the south facing roof, we have achieved a net-zero energy building. Come see us! Growing up on a farm outside Bowling Green, Ohio, I always knew that I wanted to pursue a career in veterinary medicine. I was active in 4-H and spent my teenage years volunteering at several local veterinary practices. After graduating from Oklahoma State University with a degree in pre-veterinary medicine, I attended The Ohio State University College of Veterinary Medicine, where I received the award for Excellence in Anesthesiology in my senior year. 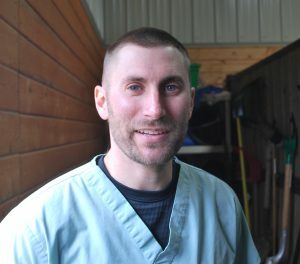 After graduation in 2012, I completed an internship at an equine hospital in Pennsylvania, gaining proficiency in surgery, equine reproduction, and lameness diagnosis and treatment. In 2013 I began work as an equine associate veterinarian in a general medicine practice in central Ohio, then in July 2017 started my residency with Equine Veterinary Dental Services. I am working toward becoming board certified in equine dentistry through the American Veterinary Dental College. I live with my wife Heather, who is also a veterinarian, and our growing family near Canal Winchester. My spare time is spent with photography, gardening and spending time with family and friends. Equine Veterinary Dental Services Copyright © 2019.